Resident Instructions are at the bottom of the page. The Plantation at Leesburg active adult community welcomes you! It's time to enjoy the resort lifestyle you deserve. Located in Central Florida, Lake County, we have the advantage of rolling landscapes and inland protection from hurricanes and salt corrosion. Florida's beaches are a little more than an hour away to either coast. With over two hundred square miles of lakes in Lake County, it's a boaters and fisherman's paradise. You are just minutes away from local grocery stores, gas stations, restaurants and downtown Leesburg, and within an hour to Orlando shopping and attractions. The Plantation at Leesburg offers two beautiful championship golf courses, three staffed activity centers offering over 100 activities, three pools, two fitness centers, tennis, pickleball, shuffleboard, bocce, volleyball, softball, fishing, and a woodworking building. Providing a central source for all neighborhood communication. Providing a calendar of Plantation community events. Keeping residents informed of safety concerns and events that may impact their community. PUT NAMES ONLY IN NAME BOXES. USE YOUR PLANTATION ADDRESS TO REGISTER. IF YOU ARE A SEASONAL RESIDENT - YOUR OTHER ADDRESS IS THE 'ALTERNATE' ADDRESS. YOU WILL BE DENIED IF INFORMATION DOES NOT CONFORM TO INSTRUCTIONS. Log in using your email address only and password you picked. This is our RESIDENT HOMEOWNERS website. If you are a renter or non-owner resident you will need the Homeowner to provide you access to the website from their log-in information. If this is your first visit please click the link to the the top right "log-in or register" and complete the information requested. DO NOT PUT ANYTHING EXCEPT YOUR NAME IN THE NAME BOXES! IF YOU ADD ADDITIONAL INFORMATION.....WE WILL HAVE TO HAVE YOU EDIT THE ADDITIONAL INFORMATION TO REMOVE IT, SO THAT ALL NAMES ARE IN ALPHABETICAL ORDER. If you are a homeowner, your membership will be approved and you will be mailed logon information. We will need to verify your residency and then you will have access to the other areas that are for residents only. All resident information is private, password protected and will not be shared. Approval's are done as notifications come in to the server and will only be approved Monday - Friday from 8 a.m. - 4 p.m.
YOU WILL NEED TO REMEMBER YOUR PASSWORD TO CONTINUE TO LOGON. If you have not logged into the website since you registered over a year ago, you will need to re-register. 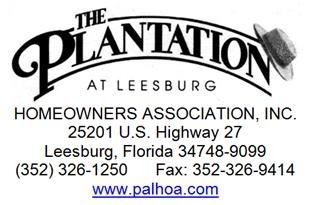 If you are a Real Estate Agent, Attorney, Title Agency, Lender, or any other form of agency seeking an estoppel letter or other documentation regarding property at The Plantation at Leesburg, please direct your inquiries to Kira at [email protected] or call 352-326-1250.